As the zombie genre continues to be run into the ground (Victorian zombies! Scouts vs. zombies! Zombies in love! ), the expectations for yet another living-dead flick are pretty low. Fortunately, solid film technique and character development can overcome viewer apathy, even when the story wouldn’t be out of place in The Walking Dead. Deep in an unnamed forest, a family tries to survive a plague that seems to have obliterated the rest of humanity. Despite having procedures in place to prevent contagion, the eldest member becomes sick and has to be “put down” for the well-being of the remaining survivors. The father (Joel Edgerton, The Gift) is careful to the extreme, and this causes tensions with his teenage son (Kelvin Harrison Jr.). The clan doesn’t have much time to grieve when a new challenge arrives in the form of a stranger (Christopher Abbott, Girls), who claims his family is in dire need of water and has food to trade. The father agrees to take them in, seemingly unaware of the many unknown factors he’s adding to equation — most evidently, bringing an attractive young woman (Riley Keough, Mad Max: Fury Road) into a house where the resident teenager is trying to cope with his loneliness. 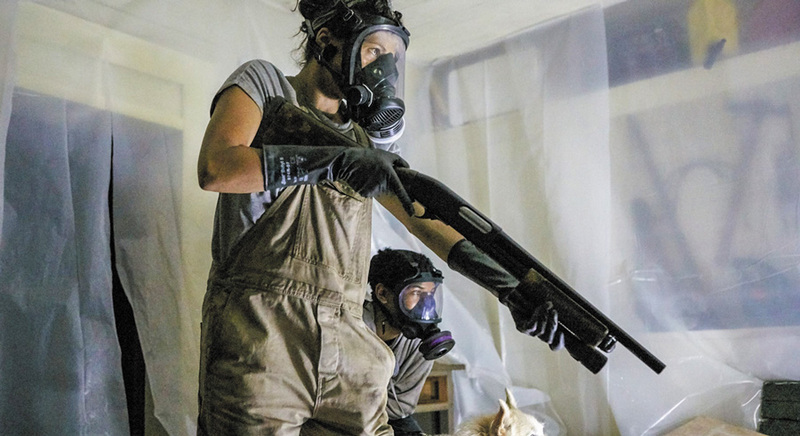 It Comes at Night makes great use of classic horror concepts like global epidemic and cabin fever by dispensing them in small doses. Nobody is an outright villain or a stooge, they’re just a group of flawed yet competent people trying to survive an impossible situation. The sexual tension amplifies the danger and, without any laws to restrain them, the characters’ moral limits are in constant flux. Director Trey Edward Shults (Krisha) does a decent job filling the setup with dread and delivering on the promise of violence. There is a clever bit of misdirection regarding the source of conflict. Much like in real life, disaster comes from the accumulation of mistakes. A couple of faux-pas (foreboding dreams, inconsistency in preventive measures) threaten to derail the picture. But the other elements are strong enough that one is willing to overlook the flaws.